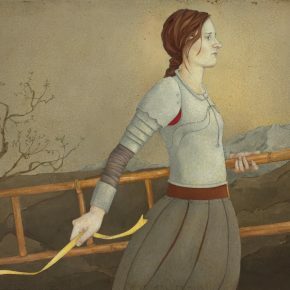 This is the second of a two-part essay on the work of James Christensen, Cassandra Barney and Emily McPhie now on exhibit at the Springville Museum of Art. The first part can be found in our February 2014 edition. Among the hundred or so figures, landscapes, and narrative fantasies by James Christensen, Cassandra Barney, and Emily McPhie in the Springville Museum, two by Christensen neatly bookend Oscar Wilde’s implied range of art-making. In “Evening Angels,” a small oil in a vintage ornamental frame, four angel musicians are borne across a crepuscular sky in a flying caravel. Where there should be a mast, a tree sprouts, its leaves in autumn colors, while from its branches bright stars and a crescent moon hang like nursery decorations. As they sail their highly ornamented craft, their music magically brings the day’s end. Hanging nearby, “Self-Portrait of the Artist Run Aground in a Flemish Landscape” is an acrylic, simply framed in black with gilt edges. Here, in a prospect out of Pieter Brueghel or Hieronymus Bosch, lies a similar vessel, though this one draws more on real examples, wrecked on rocks far inland from the distant ocean. The weather, sea, sky, fields, forests, castles, caves, and rocks—especially the rocks— all invoke the mysteriously enchanting look of Northern Renaissance painting. 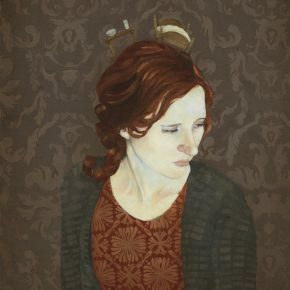 Poking from the ship’s hold, the entirely anomalous figure of James Christensen is shown in modern dress and equally modern, not to say photographic, style. These two paintings have so many attributes in common—the importance of fantasy, the appearance of a ship out of water, their deliberately depicted atmospheres, copious historical research—that their subtle differences may be overlooked. Yet by Wilde’s taxonomy,”Evening Angels” is almost all surface. The meticulously dressed angels, their instruments, and the everyday presence of magic produce a visual analog to the unheard music, and the novel idea of a boat that brings on evening makes a scientifically valid point: what we perceive as a giant theatrical event in our neighborhood, complete with beginning and end, is actually the shadow of earth’s shoulder, ceaselessly in motion, sweeping over us. Yet beyond the ravishing beauty it depicts, “Evening Angels” is most likely to create in the viewer a nostalgic ache for a wished-for, alternative agency that falls far short of the far more awe-inspiring facts. The self-portrait, on the other hand, defeats itself deliberately by placing a figure in a landscape with which he can never connect. No amount of contemplation can accommodate the twenty-first century man to his fifteenth-century environs. “Self-Portrait of the Artist Run Aground in a Flemish Landscape” contents include memoir, which is a frequent ingredient of modern art: a confession of failure (though his choice of medium leaves open just how he failed), rejection of the traditional artistic virtue of unity in favor of felt alienation, and the double self-portrait represented by placing his image in one of his favorite tropes: a vessel from the age of ornately beautiful ships. Here, despite meticulous attention to surface, the content it symbolizes wins out. Of course no work of art is entirely one or the other, but on the continuum from surface to symbol, Cassandra Barney foregrounds her surface, into which she subsumes her symbols. Her statement on the gallery wall says, in part: “My portraits may not always feature the outwardly pretty or majestic, but they all share a quiet beauty that asks us to listen and to feel”’ So she leans toward the pleasures of beauty rather than interpretation. 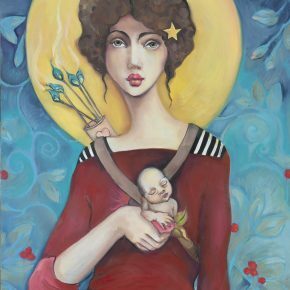 Indeed, of the three artists, all known for their depictions of women, she is the master of their grace and allure. Her faces are all symmetrical, their large eyes, long noses, cupid’s bow lips, and small chins exquisitely placed on heads that, whether round, oval, or square, are often almost as wide as they are high. Their hair, like their clothes, recall vintage illustrations. But their most distinctive characteristic is their necks, which are improbably long and gracefully curved or expressively angled. ‘Portraits’ accurately describes their most common compositions, which show a preference for full faces, with poised and idealized self-presentation. 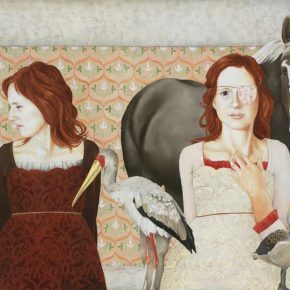 An oil from 2012 (most of the works are undated), “This wasn’t what she planned for but she loved them just the same,” disproves the notion that all her faces are the same; here four distinct (though possibly related) individuals stand together, surrounded by what appears to be the trappings of a party. On closer inspection—an option not everyone will take—every object in the background and each adornment appears to have a symbolic meaning. Nor is that its entire content: there is the inescapable implication that this is a personal story, perhaps even a message, recalling a time when friends took an initiative that misfired, though their hearts were in the right place. And, in fact, the one quality of Barney’s women that her detractors seem to consistently overlook is their gravitas. 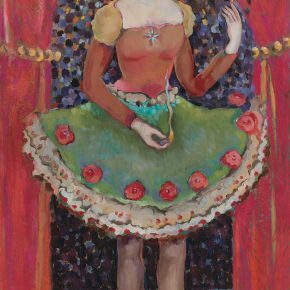 In “They Threw Roses at her Feet,” a woman in a theatrical setting stands surrounded by a ring of flowers on the stage floor. On closer inspection—once again the pleasure is for everyone, the point reserved for those who choose to seek it—she holds what appears to be a book of matches in one hand, smoke rises from the fingers of both hands, and small flames appear among the circle of flowers, ambiguously on the verge of becoming a ring of fire. Indeed, one searches in vain among both Barney’s and McPhie’s women for a smile, let alone a laugh. 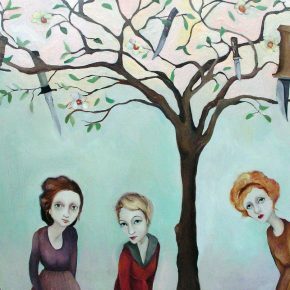 A clue, perhaps the key, to this somber quality may be on display in “Tree of Knowledge,” an earlier (2007) landscape depicting five women beneath a flowering tree in the branches of which are arrayed seven downward-pointing knives. Obviously, knowledge can be dangerous, but there is something less obvious, more personal, here as well. As in the case of “They Threw Roses,” beauty, talent, and attainment can become prisons just as easily as can their lack: alienating in themselves and in the expectations they impose. 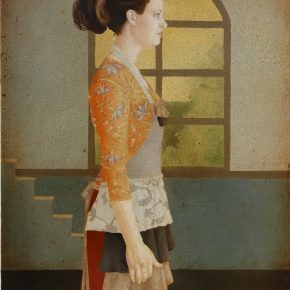 If her sister veils what she has to say behind surfaces of “quiet beauty that ask us to listen and to feel,” Emily McPhie’s prosaic, comparatively documentary figures dwell in tableaus so rich in contrasting symbolic material that they border on the collisions of surrealism. 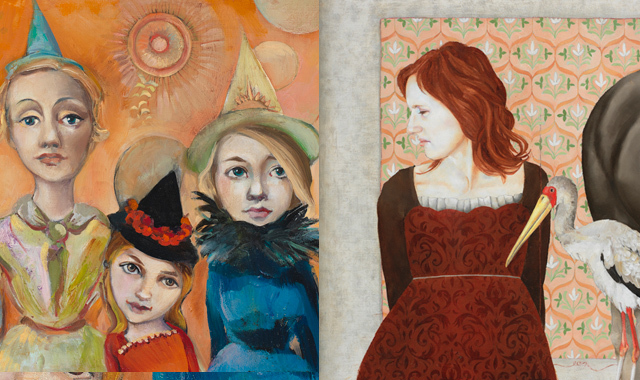 When she draws for its own sake, her looser images reveal a family resemblance to Barney’s women. 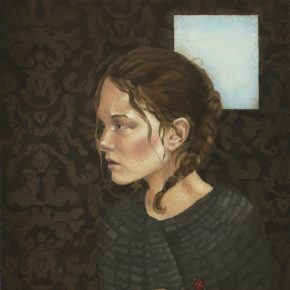 When working on a painting, however, she draws from photographs, leading to canvases that display anatomy and physiognomy of such descriptive accuracy that scenes from the Brothers Grimm, like “Mother Mansrot,” “She Ascended the Mountain,” and “I Have Washed Your Dishes, I Have Made Your Bed” end up visually indistinguishable from those that grow out of her own life as wife and mother. She means both to be read as parables, which is to say specific instances that take on universal resonance, to which end even some of her avowed self-portraits, like “Two Sisters,” which contrasts her own identity versus her role as mother, present her not as herself, but as everywoman. Still, when the anecdote stresses her personal growth, or concerns her interactions with her children, she often appears as herself, distinguished by her short shock of yellow hair. 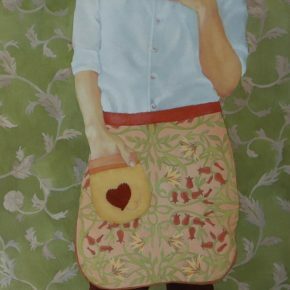 “She Wore Her Heart on her Apron Pocket” memorializes a breakthrough in self-understanding. 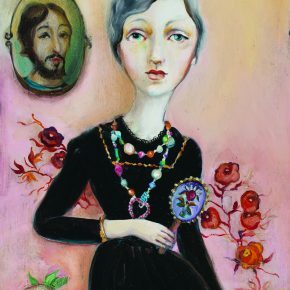 In a prose poem about what went into the painting that she posted on her blog, she describes the journey of her heart, which started out “tucked away securely in my chest,” came to be worn on her sleeve when she fell in love, and then, as her new obligations emerged and gradually made themselves part of her, it found its way to her apron pocket. The story of how she came to love what had initially been a burden exemplifies the ambiguity that underlies her work and gives it resonance that it’s not clear if the artist herself understands. In “I Have Washed Your Dishes, I Have Made Your Bed,” a malcontent-looking woman reveals a doll furniture-sized table and bed resting atop her red hair. Never having read the Grimm brother’s Household Tales, I initially took it to make visible a woman’s internal conversation with her husband, or perhaps her family. After I read “Old Rinkrank,” the source of half a dozen of the paintings here, I realized that while I was wrong, I could also be right. The nameless princess of the story, seeking to escape her father for a husband, falls into an inversion of her life, in which she becomes a slave to the man who keeps her. Here feminists and mothers who practice the ‘unconditional devotion’ McPhie celebrates can each find their disparate views represented in the very same imagery. 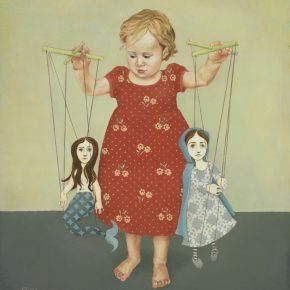 Another viewer was disturbed by seeing the artist’s children depicted as puppets on strings she manipulated; for the artist, though, it seems the impact runs the other way, up the strings. Cutting them would free her as well as them. Curiouser & Curiouser is not for everyone. Despite the critical notion that all past artistic styles are now equally valid, audiences seem to hanker after only the latest forms, as though still hoping that the next art will be the rightful successor to cubism, expressionism, or photorealism. If this limits the Christensens’ to the equivalent of Utah LDS community’s house band, they could certainly do worse. But often, good art is stymied by its resemblance to the world around it, which makes it seem trite, and only emerges into wider appreciation when that world eventually vanishes. Thus there is an opportunity, for those who can see past their historical moment, to appreciate now the things to which time habitually blinds us. 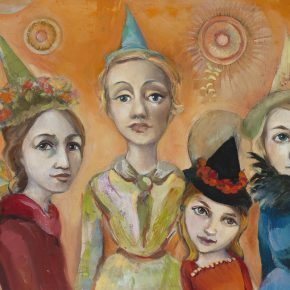 Curiouser & Curiouser: The Artwork of James Christensen, Cassandra Barney, Emily McPhie, and Familyis at the Springville Museum of Art through April 6th.